At USDiamondTool.com we know how import saw blades are in getting the job done. The right saw blade makes the job easier and the end result is better because of it. Subpar saw blades will crack, break or chip, leaving you with more work than you started with. If you're looking for the best diamond saw blades and cup grinding wheels then you’ve come to the right place! Every saw we sell is used by our staff, so you can be sure we stand behind their quality. We know what works best! Shop our selection of dry diamond saw blades, wet diamond saw blades and cup grinding wheels for all of your sawing needs. Top Quality Dry Diamond Blades for any application. Dry Blades can also be used with water. Wet Blades for cutting reinforced concrete and asphalt. 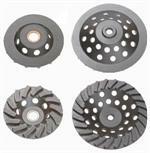 Cup Grinding Wheels are used to grinding and polishing. Available for concrete and granite/marble. Tuck Point Blades are used for tuck pointing in mortar joints. Crack Chasers Clean and repair cracks in concrete and other materials.